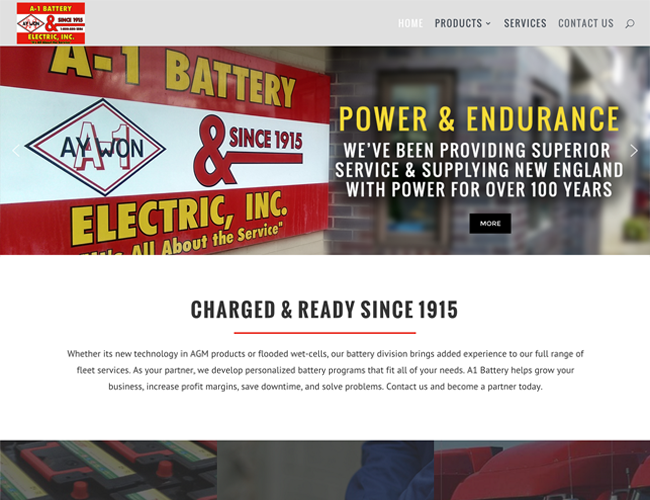 A1 is a supplier of automotive batteries and electrical services with more than a century of history in Quincy, MA. They are building up their battery sales volume and needed a website that appealed to their customers. We provided a mobile friendly start that is ready to expand into an e-commerce platform as they grow. A1 needed to balance cash flow against the need to step up their game on their highest margin products. They weren’t ready to jump right into online sales, but they know they will be doing so soon. We worked with them to create a catalog site so that once their operations are ready to make the jump, we’re ready to flip the switch. Immediately, they can start selling batteries, starters, and alternators without creating headaches for the way they do business. Charged and ready, indeed.